What is the 3-Day Hridaya Silent Meditation Retreat? The 3-Day Hridaya Silent Meditation Retreat is an intensive meditation retreat-course designed both for those who want to have a taste of a meditation retreat and those who don’t have enough time to experience a 10-day retreat. Both beginners and advanced practitioners of meditation are welcome to dive into the beauty of meditation, Hatha Yoga, and non-dual teachings of the great sage Ramana Maharshi. During the retreat, various methods from different traditions, such as Tibetan Buddhism and Sufism, are also presented to support the practice of non-dual teachings. 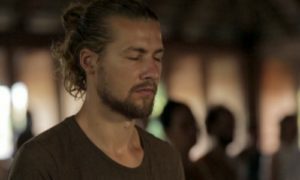 The 3-Day Silent Meditation Retreat is offered by Sahajananda and other Hridaya Teachers at our home in Mazunte and all over the world. It is offered monthly at the Hridaya Yoga Center. View upcoming dates below. The program and the rules of the workshop are meant to create proper conditions to experience the calming of the mind, the blossoming of the Spiritual Heart – the inner organ of direct Spiritual Knowledge. It gives us the taste of the essential “dimension” of our being – Stillness. View all upcoming 3-day retreat dates below and click Register Now to reserve your spot.